One of the basic rules of conventional photography is that you’re not supposed to shoot into the sun. Usually, the way photography works is that light illuminates a subject and youphotograph the subject, so there’s a triangle. With the sun photographs, I’ve cut off this triangle and gone straight to the light source. The result is a reduction: what remains is the light source, the mechanism of the camera and my position or vantage point. 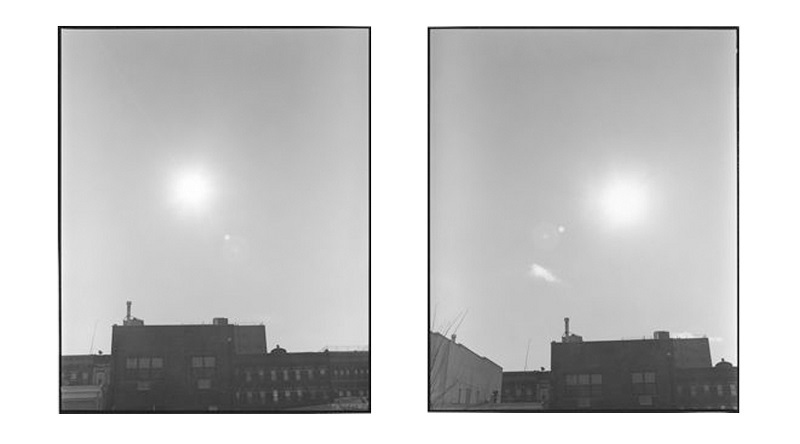 What you see in these photographs is not actually the ball of the sun, but rather, the light that emanates from it. I guess with very sophisticated equipment you can take a picture of the sun itself, but with my camera, I’m just registering the light. As the light hits the lens, there is flare and glare, and this shows up in the pictures. In this way, the process of taking the picture is recorded. Photographing the sun is a way for me to turn the camera back onto photography itself, and to deal directly with structures of seeing and depicting. Leonard was included in documenta IX and documenta XII, as well as the 1993, 1997, and 2014 Whitney biennials (for which she won the Bucksbaum award). A major European retrospective of Leonard’s work began in 2007 at the Fotomuseum Winterthur, traveling to the Museo Nacional Centro de Arte Reina Sofia, Madrid; MuMOK – Museum Moderner Kunst Stifting Ludwig, Vienna; and Pinakothek der Moderne, Munich. An American retrospective began at MoCA LA in 2017 and travelled to the Whitney Museum.